It is the same bat-time same bat-channel, 3am wake up to make a 6:10 flight from JFK to New Orleans. The only difference this trip being it is Thursday morning and not Friday. Who could pass up spending an extra day in New Orleans on our way to Baton Rouge? Not The Quest! So, I picked up Al and we headed to JFK. Unlike the previous trip to LGA, Al is actually directly on the way to JFK. We parked the car and jumped onto the shuttle bus. Quick question…Do we keep seeing the same people on The Parking Spot shuttle bus? Al and I both had the feeling we have seen some of these people before on exactly the same bus a few weeks back. Interesting…or not. Beth says it is not. Now that JetBlue has implemented PreCheck, JetBlue Terminal 5 at JFK is my favorite departure spot yet again. It is a nice terminal, convenient, and comfortable. The only negative is, it has a Starbucks, which allowed Al his first Starbucks of the trip before we even took off. Have I mentioned that Al does not even drink coffee? He drinks Chai tea. Not a typo. The flight from JFK to MSY (New Orleans) was uneventful and I slept most of the way. If I even say that a flight was eventful, that is probably not going to be a good thing. We arrived in New Orleans at 8:30am thanks to the time change to central time. It was an early arrival, but we now had the whole day in NOLA (New Orleans, Louisiana) in front of us. We went to pick up the rental car and we had choices. We opted for the VW Passat over some Ford and Nissan choices despite Al’s objections over the lack of a USB port to charge his phone (The Quest for power). Then it was off to NOLA, but what exactly to do. I should mention that Al has never been to NOLA. I have been here a number of times for the Sugar Bowl and one National championship game, but have not been back since 1997. Each of my previous trips has included being in NOLA for New Year’s Eve. So this was going to be a little more subdued. We attempted to check in at Harrah’s but the long shot did not pay off and the room was not ready. So it was off to breakfast. The Quest tries to walk a fine line of doing the touristy things versus not getting taken by the tourist traps, but as Al has never been here, we opted for the touristy thing and went to Cafe Du Monde for a breakfast of beignets. Has fried dough and powdered sugar ever been bad? I do not think so. Mental note to myself…check the camera battery before taking it out of the case. I was now lugging around a camera that would serve no purpose but to occupy space in my pockets. Hello iPhone camera. What to do next? One of the major things I have missed in my previous visits to NOLA was going to the Garden District. So we decided to do that via streetcar. We missed our stop since we really had no idea where we were going, so we ended up taking the St. Charles streetcar all the way to the end and back. This was actually quite cool and saw some interesting things, so it was one of those fortunate mistakes. Al also learned that the reason you keep your hands inside the streetcar is that they run very close to trees, very close. We ended up getting off at the Garden District on the way back and had no idea where to go, so we wandered. In our wandering, Al had Starbucks #2. We ventured into Lafayette Cemetery #1, across from Commander’s Palace, a place I would have liked to eat but not worth getting spiffed up for. I am sure it would have been worth it, but nice clothes are something that never makes it into the luggage on Quest trips. But I digress, again. I am a huge fan of the NOLA cemeteries as I think they are quite interesting. For those not aware, graves are not dug in NOLA due to it being below sea level and the caskets would pop out of the ground, so all burials are above ground. This leads to some very ornate crypts, tombs, and burials. We had planned on doing a cemetery tour later, but this visit to Lafayette #1 satisfied our curiosity. After no luck finding an audio tour on iTunes, we just wandered the cemetery with no idea of who or what we were looking at. But it still was interesting. After the cemetery, we wandered the Garden District looking for Sandra Bullock’s house. There are some very nice houses here in NOLA and we saw many of them, but while we are sure that we passed Ms. Bullock’s house, we could not identify it. It was then back on to the streetcar to head back to Canal Street to get some lunch. Al’s pretrip lunch research consisted of his friend from The Pit Stop in Merrick, NY, upon hearing that Al was going to New Orleans, telling him that he had to eat at the Butcher. When the owner of a restaurant tells you a place that is his favorite in a particular city, it kind of becomes a must. So we headed for the Butcher. This place was definitely off the beaten path and well outside the tourist parts of the city. But I will say that the Butcher is now ranked as my fifth favorite Quest meal. The Butcher is a sandwich shop, but a highly elevated one. I opted for a lamb sandwich with Brussels sprouts on the side. The lamb was finely sliced fresh lamb that was fantastic. But as good as the lamb was, the side of Brussels sprouts was incredible. They were perfectly seasoned, perfectly cooked, and marinated in some vinegar concoction that gave them great flavor. Did I just spend a few sentences on Brussels sprouts? Such an excellent meal, that we would come back again on Sunday. After lunch we stopped at Bittersweet confections, another recommendation but nothing special. We were then able to check into our room at Harrah’s, the best room we have stayed in on the Quest so far. Thank you casino rate. After a bit of r&r, I left Al in the room, because if I spent any more time in the room I was falling asleep and was unsure when I would wake up. I headed to the casino portion of Harrah’s. The casino is far different than the last time I was in NOLA, in that in 1997 Harrah’s was actually a boat on the Mississippi. Back then, all casinos had to be riverboats even if they did not leave land. In fact, some could not even float and were built on cement in the water. There I go digressing again. It was Pai Gow Poker at first (they did not have Asian poker) and then Al, who finally appeared, and I took up a blackjack table. It was quiet. After the table turned violently against us we headed for craps. After a bunch of rolls and a roll whereby an eleven became the point, I realized I was playing a game I have not seen before, crapless craps. Craps is generally one of the better games (in terms of odds) you can play in a casino, especially when utilizing the odds bet. I knew that crapless craps did not improve my odds, it was just a matter of how much house edge was increased by the house in this very strange game of craps. After doing some research post trip, the overall house edge on a simple pass line bet goes from 1.4% in craps to 5.4% in crapless craps. Utilizing double odds (my standard), the house edge goes from 0.6% to 2.0%. Not a good game to be playing, when compared to the normal version of craps. This was intuitive at the time, but I did not realize how much this crapless craps moved the needle to the house. This was a very strange game to be playing. I will never get used to a two on the come out roll becoming a point. And taking odds with 2 as the point, paying 6:1, is a very strange thing to do. Additionally, there is no don’t pass on this layout, for obvious reasons. Al went on a very nice roll and made some money for the entire table. My usual bet when playing craps is odds working on come out rolls. This is just something I like to do but this is not typical, so I needed to say “standard” on each come out roll. Should I be honored I have my own standard at the craps table? Something makes me think this is a bad thing. As usual, I ended the session on the losing side. As usual, Al did not. In fact he made over a hundred grand (let’s see if Alexis reads this). Hello IRS. It was at this time that Brett, aka The Target, made his appearance on The Quest. After flying in from Minnesota, where he was “working”, he makes his third Quest trip. Just in time for dinner. After not getting into a restaurant Brett had chosen, we end up waiting for a table at Dickie Brennan’s Tableau. While waiting, it was off to show Al the infamous (“It means that they are so famous they are in-famous”) Bourbon Street. This included a drink on the patio at Pat O’Briens, a NOLO tourist staple. Hurricanes all around? No, Brett wimped out. Finally, our table at Tableau was ready. Tableau was good and I had a bunch of local seafood type stuff. But the interesting things about dinner were the great view from the balcony where we dined and the payment system at the end of the meal. The check was paid via iPad and we had complete flexibility on various ways to carve up the check or not. It was a cool app and I hope it catches on. P.S. While about to post this trip report, I saw an article in the December 2014 issue of Entrepreneur Magazine about Dickie Brennan’s restaurants testing this system in Tableau. It was an interesting article about the system given that we had experienced it first hand. After dinner we walked around Bourbon Street and all that Bourbon Street entails. Al experienced first hand the unmarked dividing line on Bourbon Street where all of a sudden the bars have no females inside and the all male bartenders are dancing on the bar (“Not that there is anything wrong with that”). For the protection of the innocent as well as the guilty, there will be no details or pictures from this portion of the evening. It will be sufficient to say that we saw much of Bourbon Street, heard some good and bad music, and ended up on the patio at Pat O’Briens, although no more Hurricanes were consumed. I am not sure if it was the drinking or Brett’s insistence, but we did end the night with a path for Brett to obtain Quest voting rights, something my wife has been advocating for awhile. You can see the results at https://collegefootballquest.com/guests/. Early indications from the evening are that Brett has much studying to do to prepare for his Quest trivia examination, as it appears he has only read the Boston College trip report and even that one he does not know cold. Study hard Brett, study hard. After Al declined to ride the cannon in Jackson Square, saying he would do it Sunday (yea right), we headed back to Harrah’s. Bed for those who woke up at 3am, while Brett headed to the casino and did quite well. Nice job, Target! I will end this section by stating that the French Quarter in New Orleans is unlike anything else in this country. If you have not been, it must be on your list. It certainly is much wilder during New Year’s and I can only imagine what Mardi Gras is like, but any time of the year you will experience things that just can not be replicated anywhere else. And a few of those experiences will be enjoyable. Just kidding, I love NOLA and truly enjoy the nightlife, cuisine, and all else New Orleans has to offer. P.S. – We saw a lot of Green Bay Packers gear in town for the big Saints versus Packers game on Sunday. On Friday, we had a facilities tour at 10am at LSU, so it was an early Friday wake up to make the 90 minute drive to Baton Rouge. Yes, it was a legitimate 90 minutes not a Jarrett special 90 minutes. The most interesting part of the drive was the conversation that started with “Is this a smart school?” followed by “They look pretty smart but the more south you go…” I did not utter either line, but the resulting conversation was riveting. We arrived at LSU and met up with Jason S. who was gracious enough to provide us with a tour of Louisiana State University’s athletic facilities. First stop, Tiger Stadium. All that I can say is “Wow”. Standing in the empty stadium, this is clearly the most impressive stadium of The Quest thus far. And it is not even close. We stood on the field looking up at the stands around us and I was simply awestruck. The stadium rose up vertically like a wall. I could only imagine what this place is like with over 100k in it but even empty, it was simply awesome. We were fortunate enough to be able to go into the locker room next. The traditions at college venues are something unlike anything that exists at the professional level and LSU was no exception. 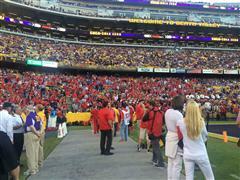 It was great to be able to see “The Win Bar” that all LSU players touch right before stepping onto the field. I love these kinds of things. Next stop was the club level, press box, and anywhere else that we wanted to go. I think we took Jason to some places of this stadium that he has not seen yet. We went up to level 600 of the new end zone which has to be the highest point in a stadium anywhere, or so it seemed. It is high, but has a great view of the field. Because of the way that it is built, despite being incredibly high it is not far from the field and had a great view down onto the field. It is almost as if you are on top of the field and not away from it. I think if you fell from the upper deck you would land on the field. Great design, great view. The entire time, we were receiving great information from Jason on LSU history, stadium history, and just great general information. This will have to be the loudest stadium to date, no doubt. But we will get to that tomorrow. Next up, Mike’s habitat. Mike is the LSU mascot and he lives right next to the stadium in an absolutely beautiful habitat overseen by the LSU veterinary school. Nice digs. Check out the pictures. After that, it was onto the Maravich Center, home to LSU basketball, volleyball, and whatever else fits. One of the things that is very clear walking around the facilities is that LSU does an excellent job in showcasing awards. Everywhere you turn, there is a beautiful display of awards for a particular sport. The Maravich Center, in this tradition, has a very nice display of basketball awards. This is in addition to the fierce looking Shaq statue right outside the building that weighs 900 pounds, just slightly less than Shaq himself. For those unaware or forgetful, Shaq went to LSU, and for more than one year. Then it was onto Alex Box Stadium (baseball), while passing a functioning oil derrick. Yes, LSU has a working oil derrick on campus. Oil that is, black gold, Texas tea. LSU has a great baseball tradition and the stadium reflects that. It is one of the nicer college baseball stadiums you will see. It was then time to part ways with Jason, who spent an incredible amount of time showing us around and we are truly grateful. Thanks Jason for giving these 3 New Yorker’s a great experience at LSU. After a quick lunch in the union, fast food galore, we took a visit to the ESPN GameDay set. It is truly amazing what an operation GameDay has become. We watched them film some bits for today and tomorrow and had some interesting conversations with ESPN staff on operational issues, security, etc. These guys that make this traveling road show work are truly fascinating people with some great stories to share. It is definitely worth talking with them. No Beth, I did not have a chance to speak with Kirk, like you did in a freight elevator in Jacksonville decades ago. After making the typical donation to the school via the bookstore, it was off to the hotel to check in. I am very fond of Sleep Inn as a chain because it usually offers great value and the doors open to a hallway and not the outside. Sleep Inn has become our go to place to stay in Gainesville given the value and great hospitality we get from the family owned staff that always welcomes us to Gainesville. The same can not be said of the Baton Rouge Sleep Inn. The room seemed half size and the bathroom seemed quarter sized, with a shower thrown into the oddest place, seemingly as an afterthought. The shower looked tiny but was actually more spacious than it seemed. Still, this was not one of the better rooms we have stayed in. 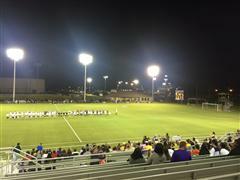 After a little rest in the room, we headed out to the LSU versus Kentucky woman’s soccer game. We almost parked at the high school football game taking place next to the soccer game that had maybe ten or more times the number of people at it. Friday night lights in the South! The soccer stadium was very intimate, which is a nice way of saying small. Kentucky seemed way more skilled than LSU and we left at half time with Kentucky up 1-0, with Al managing to NOT get in trouble with any of the athletes parents. It was off to dinner. Dinner was at Roberto’s River Road Restaurant, a place recommended by Jason. It was most definitely a deja vu moment in driving to Roberto’s as we had visions of our drive to Cagle in Lubbock. It certainly seemed like we were driving outside Baton Rouge into parts unknown. But when we arrived, the place was packed. So it certainly looked like a good choice and we were not as in the middle of nowhere as we thought. This certainly looked like a hidden gem that was not so secret. We had to kill some time at the bar, but it was worth the wait. Al and Brett went steak and I went more local with the fish special. None of us were disappointed. A very excellent choice. Food critic Jarrett took the meal off, but he does highly recommend the place should you find yourself in Baton Rouge looking for a very good meal. I should mention that this was not the Friday that was planned. We had grand visions of going to downtown Baton Rouge and seeing some government buildings, governor’s residences, climbing a tower, and seeing some other historical places. We never made it. Having no idea what to expect when we hit campus and Jason offering to show us all we wanted to see, we changed our plans as that is not something you decline because you have other plans. Sometimes on The Quest, all the pretrip research goes for naught. Sometimes it is for bad, but other times, like this one, it is for good. We never made it to downtown Baton Rouge at any time during this trip and there is an entire part of this city and downtown that we never saw. We do not know what we missed and it will be a missed opportunity, but many times we need to adjust on the fly and I do not think I would trade our experience at LSU for anything. So such is life. Maybe one day life will have me in downtown Baton Rouge again, but for now, all that research and planning went out the window. The best laid schemes of mice and men often go awry. ESPN recently lengthened GameDay to 3 hours starting at 9am Eastern. That is 8am central. So Saturday came with an early wake up…again. We arrived at our most excellent parking spot at around 8am and there was virtually no one else around. Except two guys setting up a tailgate directly behind our parking spot. It was one of those scenes of desolation but four guys standing in a 8x8 space. No worries as we were not staying, but I will come back to these guys later. Anyway, we parked the car and headed out the the GameDay set. We arrived about 15 minutes into the show and the crowd was beginning to grow. Al had reached out to the Washington State Cougars folks to discuss how they have been able to get the WSU flag at each GameDay. He was informed that they ship it around to various local alumni who show up to get the flag on tv. Today’s flag bearers drove from College Station, Tx to do their duty. We caught up with them and hung out with them during the show. Al and Brett even waved the WSU flag. “It is harder than it looks.” I think the WSU guys told us that it has been at GameDay for 158 straight games. Quite a feat. They need a FedEx sponsorship. Going to GameDay live consists of a lot of standing around, sometimes in very hot conditions like today. There was not a cloud in the sky and that was not a good thing. We could have used the shade. Today would be a very sweaty day, which is the flip side to no cold weather places in October and November. What GameDay always provides is people watching that is unbeatable. Additionally, the signs that people bring to get on tv are quite creative. The previous week, Katie Perry was the guest picker during GameDay’s trip to The Grove. She made a reference to Tiger Stadium smelling like corn dogs. 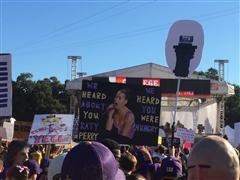 The LSU fans took this and ran with it as there were many signs with references to Katie Perry and corn dogs. Some were actually in good taste and most were really funny. You can really do a lot with Katie Perry and corn dogs and some are even not triple X. It was during GameDay that Keith, our reporter du jour, met up with us. Some background here is required. Some time ago, I saw an ad in USA Today Weekend calling for the most devoted college football fans to submit an entry for an appearance in a future edition. I sent it to Al as he is The Quest’s official contest enterer, and he entered on our behalf. Some time later, we got a call from the editor that we did not win. This contest was for face painters, superstitious types, and other things that can be captured in a photo and a caption, not what we were doing. But he was very interested in The Quest and wanted to do a story or two about us; one to run this year and one as a feature in their preseason 2015 edition. We thought that was cool, but did not give it much further thought, in the yeah right vain. A few weeks before our LSU departure, we got a call that they would like to trail us during our visit to LSU and do a story. They were dispatching a reporter and photographer. We were contacted by the reporter, Keith, and we did some background interviews before the trip. I guess this was actually happening. We had a not so good experience with a photographer during our visit to Western Kentucky, but this was going to be a professional who earned a living as a writer, so maybe this would go better. In any event, we met up with Keith in person during GameDay. After GameDay we had seven hours until kickoff. So, tailgating it was. Jason had secured us an invite with a tailgate party so we headed over there. These guys had the primo tailgate spot. Very close to the stadium and right on the corner in the front row. I am not going to go into very specific details (stop rolling your eyes) about the tailgating. There are many pictures in the photo album and tailgating consists of mainly drinking, eating, and hanging out. We had many good conversations with lots of LSU faithful, met many people, and generally had a good time. You can picture it. Not that. There did come a time during the seven hour tailgate that we wandered the scene. LSU tailgating is exactly what you expect when you think of good tailgating. There was really nothing that LSU was missing, except possibly the elegance of The Grove. We headed over to the main RV lot to catch up with some people Al met on twitter who invited us over. These guys will get special mention. The folks at The Unsupervised Bus took a run down school bus and transformed it into the ultimate tailgate vehicle. Words can not do this justice, so please check them out in our photo album and on their Facebook page at https://www.facebook.com/unsupervised. The inside of the bus in quite tripped out with the ultimate in tailgating, including the always necessary “safety” pole. Which we were informed does not get much use when its crowded because the girls are shy, but when you have the right number of people and the right number of drinks, it is a nice amenity. Good to know for our next RV rental. And Tiny says, his wife is very supportive. I’d like to know how he pulled that off. Our host at T.U.B, was a guy named Tiny. He went about 6’5”, 300, and was the guy in the group named Tiny. Tiny drinks a 64oz jug of Jack and coke and goes through about 4 bottles of Jack during a typical tailgate. And he is probably only buzzed. Nice! That gives you an idea of the group we were in. But these were great guys out to have a good time. They invited all comers and were incredibly friendly. We had a great time hanging out with these guys and if you find yourself at an LSU game, seek them out. You will not be disappointed. Additionally, I should mention that they have an LSU coffin as a cooler. No, that is not a typo. My wife thought it strange when I cut out an article many years back showing that you can get University of Florida coffins for actual burial. These guys had an LSU coffin and were using it as a cooler. That’s just awesome. Beth chimes in, not awesome, weird. I should say something here about Southern hospitality. Many people think it is a myth. LSU fans do have a reputation and being somewhat unkind to visiting fans. This is something we heard in many places including my time at Florida. I will say that I was not here as a visiting fan but I did have my Florida Gators hat on the whole time. We were treated great by everyone we came into contact with. We did not spend much time in the largely student areas, so that could be at play here, but we were treated very well everywhere that we went. People opened their tailgates to us, invited us in, and offered us food and beverage. Much obliged to all. At some point, we headed back to our original tailgate home and spent a bit more time there before meeting up with our good friend Crimens and her boyfriend, William. You may remember (and if you do not please read the Ole Miss trip report) that we met Crimens during our trip to Ole Miss and she is now following us wherever we go. Just kidding, but when she found out we were headed to LSU, it was an easy excuse for a road trip. She and William were supposed to arrive hours ago, but you know. Anyway, after a long discussion of Crimens trying to figure out where she was, we met up. She had asked a tailgate group if she could buy a few beers off them as they just got into town and did not have a chance to stop. She and William were invited in to join the tailgate and take whatever they wanted. And they were decked in Ole Miss gear. See, Southern Hospitality or she’s a girl, not sure. We parted ways and headed to the car to get a few things before going in. Remember those guys setting up when we first arrived. Well, for some reason they were dumbfounded that we returned. They could not believe their luck that when we showed up at 8am, they thought we were going to be fighting for our space in an otherwise empty lot, but we left and never came back. They had many stories to tell us about what happened to them during the day and just went on and on. I know, kind of like this trip report, but you can stop reading any time. Not you, Beth. But somehow, they did manage to end up with an Ole Miss golf cart. They told us how that happened but I still don’t understand it, in either sense of what they were saying or how it happened. Ten hours of tailgating will do that. It was time to enter Tiger Stadium. We had passes that allowed us onto the field before the game, so that is where we headed. The photographer (remember the journalist and photographer) took many pictures of us down on the field. This is the only point where the photographer felt a bit intrusive, but it was not a big deal and went quickly so all in all not bad. Tiger Stadium with people in it was even more impressive than the day before when empty. There are really very few words that could convey this environment. I will leave it as “just awesome”. Loud and imposing are two more. We walked in by the student section and it was jammed and loud. Just the way it should be, and this was 45 minutes before kickoff. At some point, we headed over to the Ole Miss side line and ran into some folks we met last year at Ole Miss, including Joe S. It was somewhat awkward being by the Ole Miss bench in an LSU shirt and Florida hat, but still not as awkward as when I was on the Nebraska bench wearing the Florida hat. There were some curious looks especially from the Ole Miss fans directly behind us, but such is life on The Quest. We had some interesting discussions with Joe and he told us that as loud as this place was, and it was, he said Texas A&M was louder. He said that from their trip there a few weeks ago, his ears are still ringing. College Station just moved up on the list. Time ticked away, the teams came on the field, the national anthem was sung, and no one asked us to leave. It might have been that we were on the Ole Miss side, talking with Ole Miss staff, and looking like we belonged, but we just stayed. I have to say that being on the field is not the best place to see a game. In fact most of it is seen by watching the video board. But is a great experience being that close and when the play is right in front you, it is a great view. But that is only for a few plays, the rest of the time, not such a good view. Al and I both picked Ole Miss (another one wrong) but these were probably heart felt picks as I was definitely leaning LSU (that’s twice this year I talked myself out of winning picks), but rooting for Ole Miss. Let me explain. I normally root for the home team unless I have a reason not to, like Florida State, Georgia, etc. But given the circumstances of this game, meaning Ole Miss was undefeated, and our closeness to Ole Miss, I had to root for them. If the situation was reversed and it was LSU undefeated, it would have changed things. But I had to root for Ole Miss to stay undefeated. Sorry Tigers, but I hope you understand. Plus, it allowed for the Ole Miss fans directly behind us to be confused by a guy on the Ole Miss side line, in an LSU shirt, and a Florida hat to be rooting loudly for Ole Miss. Please feel free to skip this part as I am now going to report on the game itself. If this does not interest you, skip ahead to the next section, or don’t. Beth says thank you and she did. Results are not indicative of the decisions that are made. Good decisions can turn out poorly and bad decisions can work out well. But most of the time, good decisions work out well and poor decisions do not. This game ended on two poor decisions by Bo Wallace; one the Rebels got away with, the other not so much. Trailing 10-7 with seconds left, the first poor decision was a neutral result when Mr. Wallace threw up a jump ball to the right corner of the end zone and the ball went incomplete, after the Ole Miss receiver broke up a sure interception, perhaps committing offensive pass interference that was not called (it was). After a Bo Wallace scramble, Coach Freeze sent on the field goal unit for a 42 yard field goal and the tie. Not fast enough, Ole Miss was called for a delay of game penalty. Lining up for the now 47 yard attempt, Coach Miles called time out to ice the kicker. Turns out, he iced Coach Freeze and Bo Wallace. The timeout gave Coach Freeze time to think and he put the offense back on the field. This is not necessarily a bad decision. Nine seconds is a lot of time with a timeout and a quick 10 yard out, makes this a much better field goal chance. Plus if someone breaks free, you could win the game. I am sure that it did not enter Coach Freeze’s mind that Bo Wallace would make a second poor decision not having learned from the first one seconds ago. Wallace threw a jump ball in the left side of the end zone which was intercepted, winning the game for the Tigers. This was not a game of offense precision. Some credit should be given to the respective defenses but it should also be noted that neither offense was in rhythm. I saw an LSU team determined to win on defense and not place their young QB in any situation to make a costly mistake, only throwing 16 times compared to 55 rushes, and an Ole Miss offense that seemed out of sync all night. After Ole Miss began the game with a 5 and out, LSU went on a nice 11 play drive to the Ole Miss 12, surprisingly throwing on 2nd and 3rd down, and missing a field goal. Ole Miss then drove to the LSU 30 and faced 4th and 2. Coach Freeze decided to go for it and the Bo Wallace pass went incomplete. LSU drove the ball to the Ole Miss 3 yard line before fumbling into the end zone. Recovery Ole Miss. Ole Miss made LSU pay and went on their best drive of the game with Bo Wallace completing two long passes, as Ole Miss went up 7-0. At this point, the offenses were having some success and it looked like this game could have some points. Both teams moved the ball early. The second quarter began with LSU fumbling on its fourth play. After a string of penalties, Ole Miss punted. LSU then came up with their drive of the game, 90 yards 17 plays and only a field goal. 7-3 Ole Miss at the half. The Tigers had three red zone chances in the first half and had 3 points. That is not a recipe for success. The third quarter was not pretty; six punts and an interception. Five punts came on three and outs. The first Ole Miss possession of the 4Q continued with the 3 and out theme. LSU then went three plays and an INT. Ole Miss went three and out. That is now nine possessions in a row of three or less plays! 12 rushing plays later, LSU was on the Ole Miss 3 yard line. The first pass of the drive is a TD, 10-7 LSU. The only TD that LSU got was all that they would need. While this was not exactly an offensive clinic, it was a very exciting nail biter of a game, Definitely the best game of the Quest thus far. After watching the 1H from the side line, we headed up to the press level for the 2H. We stopped by the Ole Miss AD box and said hello to some old friends, including the AD Ross Bjork. Ross is truly a great guy and has been very gracious to us. He is also a great athletic director, as he has turned Al into a full fledged Ole Miss fan inclusive of athletic donations. What Mr. Bjork has been able to accomplish at Ole Miss is remarkable and he even managed to turn a profit for Ole Miss when they upset Alabama and stormed Vaught-Hemingway Stadium tearing down the goal posts. Ole Miss raised enough money to cover the SEC fine and new goal posts, as well as some extra “rainy day” funds. @RossBjorkAD is a great follow on twitter as he is very active and while I am sure he holds back some, he is very forward with fans and critics. Love the picture with the wrestling belt challenging a fan to come meet him. Ole Miss leadership needs to lock him down. But alas, it was not to be for Ole Miss on this night. They did leave having all their goals still intact as winning out would still leave them with the SEC West title and that would mean the college football playoff is still very much a possibility. 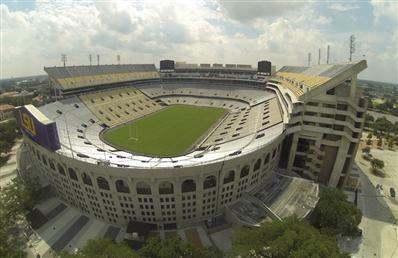 Tiger Stadium was awesome; loud, electric, great views. Just a great environment! LSU stormed the field. Really, LSU. You have been there before. This was not a field storming win. We saw Lee Corso on the sideline. Is this guy allowed to go wherever he wants? And does ESPN have three guys on staff just to watch him and make sure he doesn’t get into trouble? After the game, we hung out with Jason, Crimens, and others in a private tailgate to let the traffic die down. Liquid refreshment was still available. If they delivered pizza to this tent we might not have ever left. After hanging out for a bit, we said goodbye to a truly great host, Jason, as well as Crimens and William. Maybe we will meet up with Jason in South Carolina next year for LSU at South Carolina. Finally, a little bit of sleep before the 90 minute ride back to New Orleans. We had a late flight home so we had a bit of time to spend in New Orleans. Of course, we thought the Saints game was at 12pm local time so our plans were built around avoiding the non existent Superdome traffic. We planned our arrival into New Orleans so that we could have a repeat lunch at Butcher. This time I opted for a pork belly sandwich as well as the Brussels sprouts and mac ‘n cheese. No way I was leaving anything on the table at this place. It did not disappoint and was just as good as on Thursday. I think that this is the first repeat meal on The Quest. Nice! After lunch it was off to Treasure Chest Casino out by the airport. A perfect place to kill a few hours, watch some NFL, and get Target hooked on craps. First, you know you are in a locals casino when you see “pick a number” and “paper scissors rock”. Seriously though, when the craps croupier says “What’s up? Have not seen you guys in here before”, you know it is a tight group. Anyway, it was nice to see a normal craps table. Al and I took our spots and started to play. Brett wandered over and took watch. Since, I never roll when playing the pass, we had Brett rolling while teaching him the game. After a few times around and a full explanation, Brett was into it and took out some cash. Then he borrowed some additional cash. Then the dice came around to Al who proceeded to go on another long roll. Additionally, Al and Brett were playing something called bonus craps which are three bets that pay either 34-1 or 175-1. Of course someone went on to hit them all and Brett and Al made out quite well. Given the house edge of about 8% on this wager, I passed, which was the losing move of the day. Brett paid his debt and walked away net positive and thoroughly hooked on craps. Your welcome Randy, Ellen, and Beth. More gambling loses for me, but hey, it is entertainment, or at least that is what I keep telling myself. During this roll of Al’s, the time to leave for the airport came and went. So when the roll finally ended, it was time to head off to the airport and back to NY. After the customary delay, this time only 30 minutes, we arrived back in NY with no issues, other than MSY not having PreCheck lanes. I was in bed by 11:30pm. Enough time to get 5.5 hours of sleep before work on Monday. The Mississippi Rebels finished the season at 9-4, 5-3 in the SEC West which was good enough for third place, a disappointing finish after such high preseason hopes and reaching #3 in the AP rankings. The Rebels started 7-0, until losing this game 10-7 to LSU and then the following week 35-31 to Auburn. The season ended on a very disappointing note, getting demolished by an angry TCU team 42-3 in the Peach Bowl. The LSU Tigers had for them what would be considered a disappointing season finishing 8-5 and losing to Notre Dame in the Music City Bowl. The write ups get better and better. Not sure if your writing is getting better or the trips are getting better.